After discovering her sister Athena was plagued by similar nightmares before her death, Persephone “Phe” Archer decides to attend the boarding school in Shadow Hills, Massachusetts Athena applied to. Once she gets there, Phe finds herself investigating the town’s haunting past and how she might fit into it. Despite a tentative beginning (I might have groaned a bit when the novel started with a dream), I was hooked by the end of chapter 1 with an electrifying meet-cute in a graveyard between Phe and her “dream” guy Zach. Their palpable chemistry is a main attraction in this fresh, thrilling take on the paranormal romance genre. Phe is inquisitive and spunky, and though she tells us she’s broken inside, I didn’t really get that vibe from her. If anything, she felt too put together and self-possessed to be a 15 year old mourning her sister’s death. Zach is your typical brooding hottie hiding a paranormal secret, but he’s surprisingly gentlemanly and non-possessive. These two seem destined to be together…too bad Zach’s sister Corinne is dead-set on keeping them away from each other “for their own protection”. And just why they'd be better off apart despite their undeniable, magnetic attraction is part of the mystery. The more secrets about the townspeople, their strange genetic make-up, and her own seemingly mythological part in the whole affair Phe uncovers, the more the more danger she puts herself in. Though we get enough answers and teases in this installment to get a good sense of what might be going on, I have a feeling we haven’t seen the end of Shadow Hills. And that’s fine by me – because I want more! 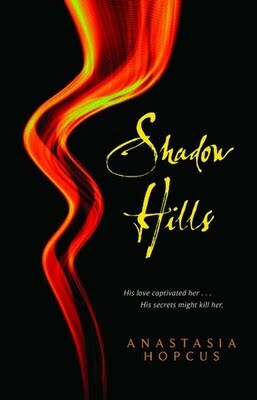 SHADOW HILLS will be released in hardcover on July 13. Find out more about it and read chapter 1 at the author’s website. Sounds interesting. This is the first I'm hearing of this one, so I'll keep an eye out! This book sounds really good! The cover of it is what originally got my attention. I'll definitely be getting myself a copy. I've never been a big romance fan, but I have read a couple of them with a dash of paranormal thrown in, and I'm kinda digging them. You have really gotten my attention with this one. The only thing that might test my patience is the "forces" trying to keep the made-for-each-other couple apart! I hate it when that happens. This one sounds like it could be really good!! I adored that this one clearly set up a series but still delivered a complete story. Haven't heard of this one yet, but the characters sound interesting as does the storyline. Great review! If it left you wanting more, that means it's good! Reminds me of The Body Finder - which is great, as I loved that one. Really excited for this! I love looking for other mythological references in books like this. Wow, this sounds so interesting. And I get what you mean about books starting with dream sequences they make me think that the book is going to be so lame and predictable, so i am so glad you really enjoyed this! Will have to order myself a copy I think. Sold! This is an excellent review. Just enough detail to get me intrigued, but not so much that I feel I know what's going to happen. Is it weird that the part that interests me most is the strange 'genetic makeup' of the townspeople? Now that's something unusual. Great review! I also would have been a little skeptical about a book that starts with a dream sequence, but it sounds like it recovers nicely! I bet this would be a really good summer read. This sounds good. I wonder if I'd find a character that is "too put together and self-possessed to be a 15 year old mourning her sister’s death" believable enough to enjoy the book, but it seems it worked out well for you in the end. This sounds so good! There always seems to be exciting things happening around the boarding schools. This one is going on my wishlist. Despite the rocky start, I'm glad to see you enjoyed it.